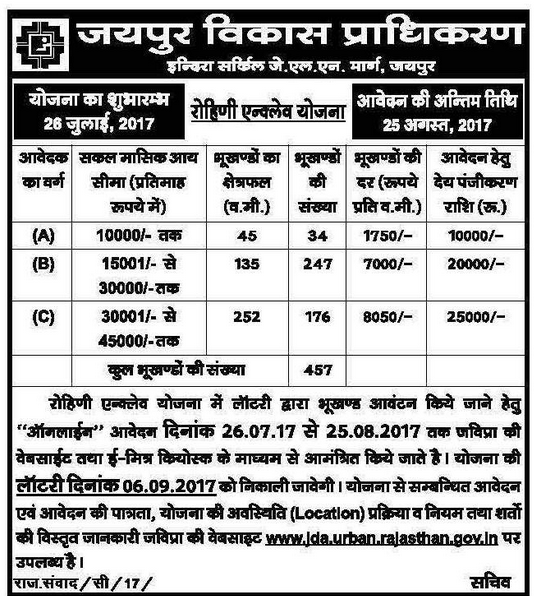 Jaipur Development Authority (JDA) has launched a new residential plot scheme 2017 for allotment of 457 plots under Rohini Enclave Awasiya Yojana 2017. JDA Jaipur has offered 457 residential plots, which are available to different category candidates. Area of plots starts from 45 sq. meter which goes up to 252 sq. meter. JDA has started inviting online applications from general public, who were willing to have their own house. Application forms are easily available at the official website of JDA Jaipur & E-Mitra Kiosk Centers. Candidates can download application forms & Rs. 236/- will be charged, which is the cost of as Application Form. Please make sure that you have entered all bank details & IFSC Code accurately in the application form. Duly filled application form can be submitted only through the official website or E-Mitra Kiosk Centers along with payable registration fee. Online registration fee is payable through Net Banking, Credit/Debit Cards. Applicant must be minor & a resident of Rajasthan. Candidate must have a bank account at his/her own name. Candidate must fall under monthly income limit that have been mentioned in above table. Candidate must not have been allotted any house or plot in previous 10 years by Jaipur Development Authority. Allotment of Plots:Allotment process of plots will be done on lease basis for 99 years. Please give us complete information about the issue that you are facing so that we can help you. Sir plz give me compete information about yours new jda plots awasiya Tohana.